Even if you only have two days in Paris, you have to make time to see Notre Dame. I had been on previous trips, but this time I wanted to experience Notre Dame differently. 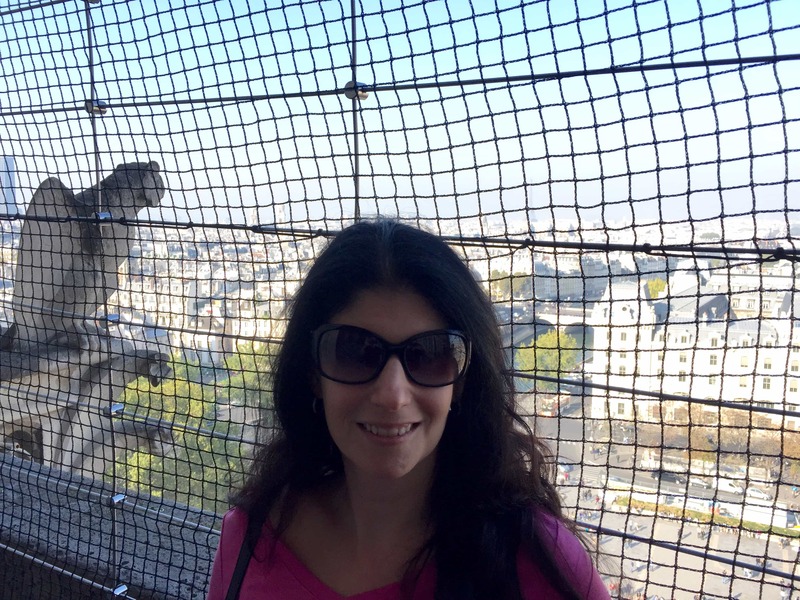 I wanted to climb the 400 stairs to the top to get a close up view of the Notre Dame gargoyles and the bells. Since Notre Dame is centrally located on the Ile de la Cite (an island in the Seine), I figured the view of the city would be incredible. Let me tell you more about what you need to see when you visit Notre Dame and give you tips for climbing to the roof. Update: There was a terrible fire at Notre Dame on April 15, 2019. I am hopeful the cathedral will be rebuilt to its former glory, but until further notice, you can not go inside Notre Dame or climb to the top. The cultural significance of this building to the people of France cannot be underestimated, I wish them every success in restoring this iconic landmark. You can make a donation to help with the Notre Dame repairs here or read more about the fire here. A great view of the Seine and it’s beautiful bridges. Note: This post contains affiliate links. Please see disclosure for more information. Notre Dame Cathedral is officially called Notre Dame de Paris which translates to Our Lady of Paris. The Church is located on the Paris Island in the middle of the Seine called Ile de la Cite. The Cathedral took almost 200 years to build. Notre Dame de Paris was the largest religious building in Western Europe until the mid 13th century. The Cathedral is 130 meters long, 48 meters wide, and 35 meters high. 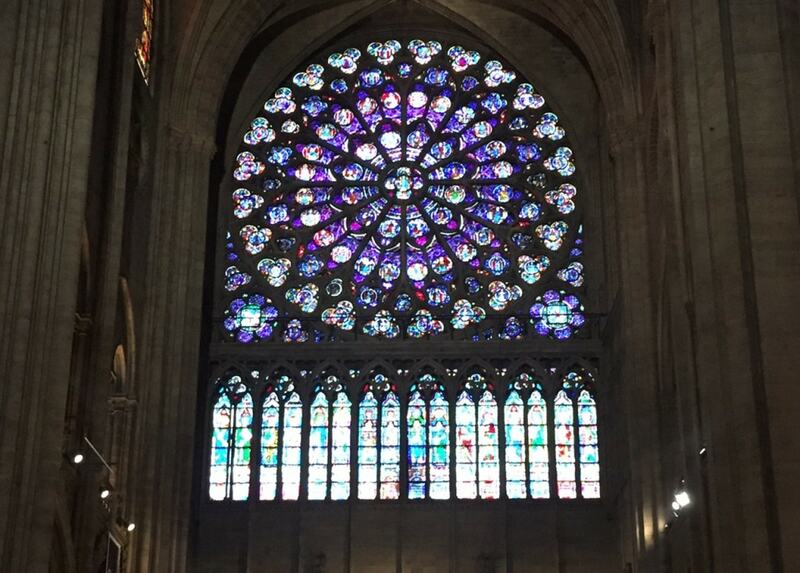 The rose windows have a diameter of 10 meters and the diameter of the cathedral’s pillars is 5 meters. The twin towers of the Cathedral are 69 meters tall, you have to climb 387 steps to get to the top. During the French Revolution, Notre Dame was converted into a food storage warehouse and the heads of many of statues were removed. A visit to Notre Dame is definitely something that should be on your Paris Bucket List! It’s a gorgeous church that has stood the test of time. First, I went inside the church, which does not cost anything to do. Sometimes you think of Notre Dame as a tourist attraction and forget it is an active Catholic church. It was a Sunday morning, so there was a service going on but you could still walk around. The music playing was beautiful. The church is very impressive. I loved the gothic columns, but my favorite thing about the inside of Notre Dame is the stained glass windows, which are stunning. If you are a fan of stained glass, you should also visit the nearby Saint Chappelle. Beautiful stained glass inside Notre Dame. After spending a little time inside, head up to the top for one of the best views in Paris. While there are a lot of steps to the top, don’t be intimated. You don’t have to do all the stairs at once, there are some scenic breaks built in. There is no elevator. And also no toilets so go before you start the climb. When we went, there was a line on the south side of the church to climb the stairs. We arrived at about 10 am on a Sunday and ended up waiting for about an hour. When I saw the line, I was tempted to skip it, but Russell insisted we wait. I am glad we did. They would let groups of 20 or so enter about every 10 minutes, so the line would move a lot and then be completely stopped for a bit. Luckily, now you can purchase a time entry ticket (€10 as of 3/14/18) for the Notre Dame climb through the mobile app “jefile.” You need to book the ticket the same day you want to go. I would recommend doing this early as it will sell out. Don’t count on it being quiet even if you are visiting Paris in November. If you have the Paris Pass, the ticket to climb is included, but you still need to book a time slot. If you plan on doing a lot of sightseeing during your visit to Paris, you should consider getting the Paris Card so that you can get access to over 60 top attractions for one price. You can find more information about the Paris Pass here. 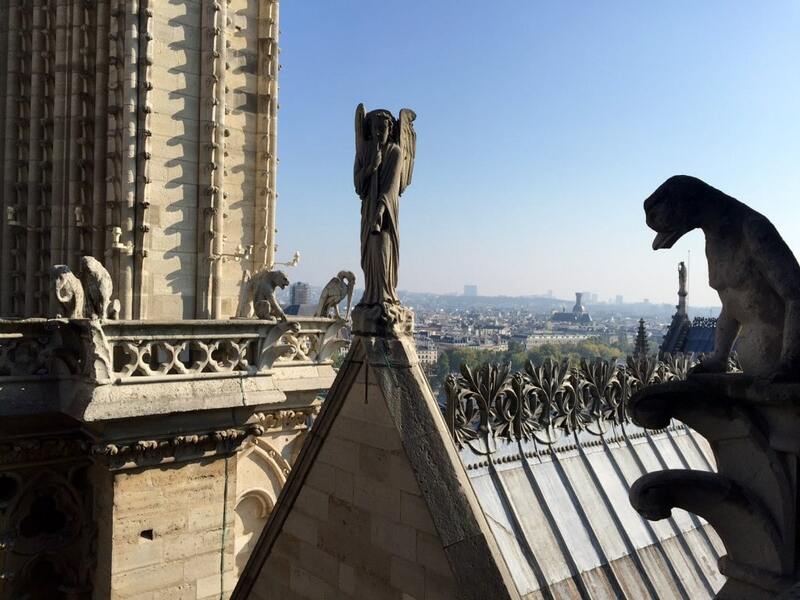 Some gargoyles and the roof of other parts of the cathedral, plus view of Paris in the distance. Once everyone in the group has gone through security and checked tickets, you start the climb to the next level. 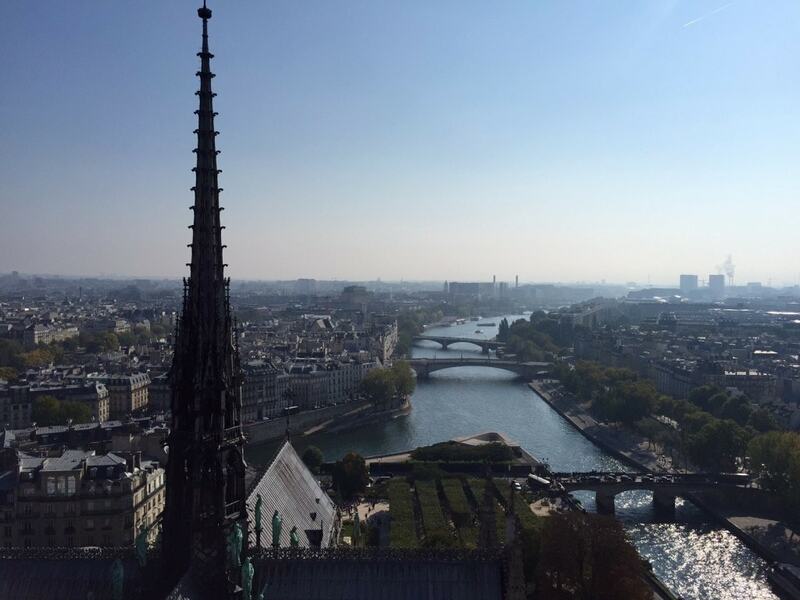 On this level, there is a great view of the city and also of the Notre Dame Paris gargoyles. I enjoyed seeing the sculptures up close so that I could appreciate the details and differences. There are some parts of the viewing areas that had an annoying net that made getting good pictures difficult. Try to either put the camera right against the netting or try to squeeze the camera around the edges. Next, you can go in one of the towers and climb some stairs and be eye to eye with one of the bells. While we were on this level, the bells on the other side starting chiming and it was pretty loud. I can understand how the bells made Quasimodo deaf. 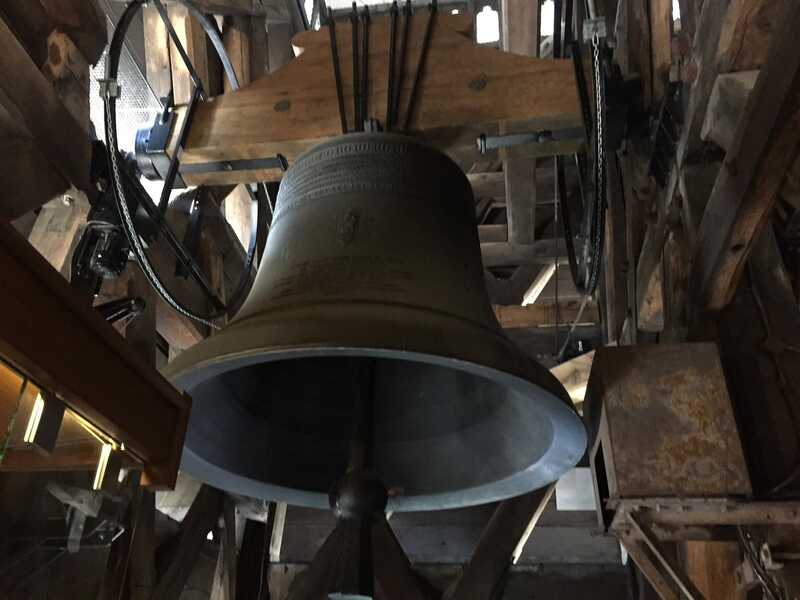 In total there are 10 bells in Notre Dame, but the one in the South Tower, known as the bourdon bell Emmanuel, is the most prominent weighing in at over 13 tons. The other four bells are located in the North Tower. The cathedral’s bells were traditionally rung by hand until electrics motors were installed in the 20th century. After you get some pictures of the view, the Notre Dame Cathedral gargoyles, and the bells, it is time to climb the last bit of stairs to the top. You might have a slight wait because this set of stairs is used to go both up and down since it is not wide enough for two way traffic. Here I am in front of the netting, luckily you can still take pictures through the holes or around the edge. You can get close to the bells! View from the top, the dome in the distance is the Pantheon. We did have to wait a little bit before we were able to come down. Going down there are no breaks, but of course, going down is much easier. After we finished, we decided to reward ourselves with a crepe from one of the shops across the street. But any excuse is a good excuse for a crepe, especially when you are in Paris. 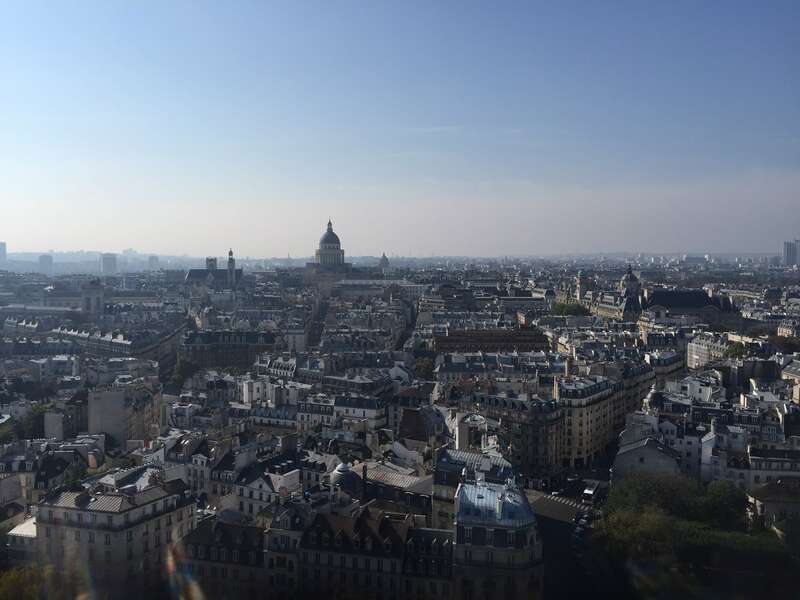 Have you climbed to the top of Notre Dame or any other churches? Was it worth it? I would love to hear about your experiences. Use the restrooms before climbing the stairs to the top. Reserve your timed entry early in the morning on the day that you want to do the climb. Be sure to go into the tower to see the bell. Reward yourself with a crepe after your climb. Disclosure: This post contains affiliate links. This means we will receive a small commission for some purchases made using links in our blog with no additional cost to you. Please be assured we would not promote any product unless we believe that our readers will also benefit. The commission does not influence the editorial content of this site. I love it. There’s nothing like getting up on top of the city like you can in a bell tower. Love your photos.